The shoes descried by the bride: The first thing I did when wedding planning was order custom hand tooled leather shoes- totally sensible, right? I just had to have a pair – it was the perfect western touch to pair the southwestern jewelry I would wear with my beautiful dress! I had my new initials included in turquoise. I like to joke with Seth that that’s why I committed to changing my last name – but it’s just a joke!! Q: What were your invitations like and how did you pick them? A: Ugh, talk about a wedding stressor. Picking out the invitation was probably one of the worst things to have to decide on! We used Minted for our entire paper goods suite, again because in South Eastern New Mexico you order everything online ;), and had a great experience. I actually copied the wording from my parents invitation and updated with our detail. That was kind of special as my parents had copied wording from the invitation of my mom’s mom. Seth and Johnna both went to Oklahoma State University for college. Johnna claims she didn’t really meet Seth until graduate school orientation. Seth would tell you that Johnna was the loud girl in his junior year Price Analysis class. They went through the Agricultural Economics graduate school program together with offices across the hall and shared nearly every class together because that’s what you do with a cohort of like 25 people. After a couple years in graduate school, Seth and Johnna went their separate ways with Johnna heading to Wichita for a job, and Seth heading back to New Mexico to work on the family farm and ranch. Later that fall, Johnna took a trip to visit Seth in New Mexico and knew there was something special about that guy. They kept in touch and eventually started long distance dating. Two and half years later, Johnna was offered a job working in New Mexico and made the move. On February 23, 2018, Seth asked Johnna to help him repair some water equipment, but he said he couldn’t get out to the ranch until later that evening. Seth just smiled when she pulled up and then said they needed to feed the cows first. Johnna and Seth laugh remembering the drive to find the cows being one of the bumpiest rides they’ve ever been on. 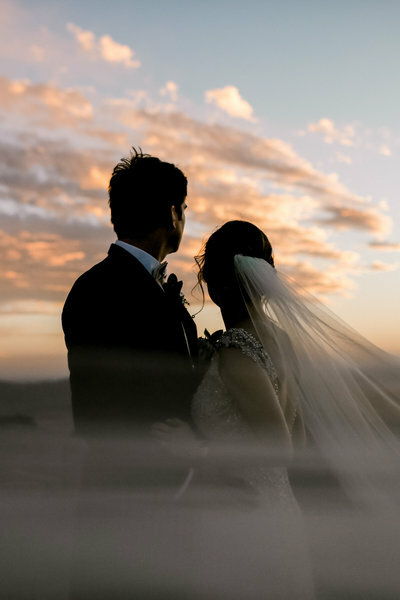 After they finished feeding, they bumped back along to the headquarters where Seth asked Johnna to sit on the house front porch and watch the beautiful sunset. It was around 6 pm, and Johnna said, “Okay, but just for a little while because I’m hungry.” (naturally…) Seth told Johnna to go sit down and he’d be there in a minute. While Johnna read, Seth had gotten down on one knee and ‘popped the question’. Of course, Johnna said YES! 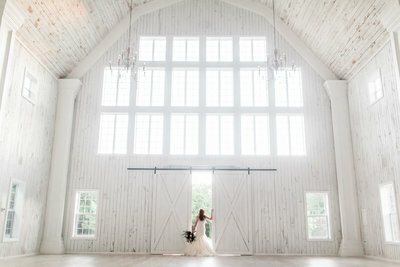 Q: What was your color palette/style for your big day? A: Color: Cabernet and dusty rose with rose gold accents. Style: I went for New Mexico meets Oklahoma and attempted to cross in some elegance :). We have such a great family and community in New Mexico so we wanted to incorporate that feeling in our wedding. Oklahoma was my home, and I couldn’t imagine getting married anywhere else. It’s the state where Seth and I met and ‘grew up’ during college. We had New Mexico chile ristras on our arch and sweetheart table- a common décor finding in NM made up of dried chile peppers strung in an artful display. Q: What is your favorite photo and why is it your favorite? A: Hard tie between the photo of Seth picking me up outside and the photo of both our families together with us. Last summer I would often be cooking dinner when Seth would finish working. He always came in and gave me a big hug and most of the times, lifted me up. I would usually yell to put me down and complain because I’m trying to cook; that’s why he’s special.. he makes me stop to enjoy the moment. 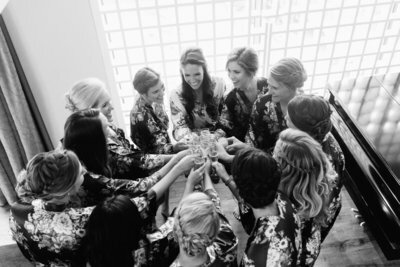 The bridesmaids dresses: Picking your bridesmaids is no easy chore. I had ordered a dress from Azazie for one of my dear friend’s weddings, and I loved it and loved the price. The colors were so great – you couldn’t beat them! With it being February, long dresses seemed appropriate, but I just told the girls the color I wanted them in and set them free to pick! The flowers described by the bride: Tony really did all the magic here. 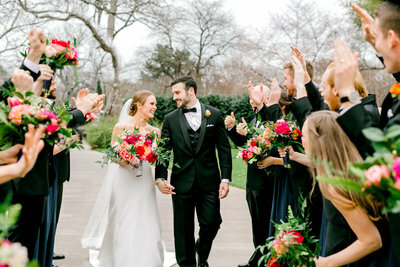 When I told him I wanted to use ristras for the arch, he said ‘you want dried chile peppers at your wedding ceremony..?’ – “Of course” was my reply. In January, I took him a box of cotton I picked and asked him to incorporate them into the floral arrangements. If I had to share any advice, it would be to simplify. I know everyone feels this way, but we had so much planning and so much going on at our wedding that it was all about what task is next. I’m a natural planner so this is hard for me to say! At the end of the day, the wedding is the start of the promise you make. Own it and celebrate it how you like, but the frills will fade; the promise does not. Oh, and give your groom a snickers bar. Maybe get one for yourself. Q: What was your wedding dress like? A: They say you’ll end up with what you never imagined… I sure did. I went in saying long sleeves and no tulle, and I ended up with strapless and a tulle bottom. That’s the beauty I ended up with! The cake described by the bride: The cake testing was easily one of the top 3 favorites for wedding planning! Tony put beautiful flowers on the cake that really made the simple elegance pop. We had a grooms cake which was really special as it had the Menefee family brand on it and a replica of Seth’s favorite tractor. Can you tell we love tradition and family? At our reception, the groomsmen ‘captured’ Seth and put a literal bowling ball and chain on his leg. This is another tradition from my dad’s side of the family stemming back to his uncle’s weddings. My dad, his brother, and countless cousins and family friends have all worn a ball and chain at their reception dating back to the late 1960’s. My dad and I did things a little different for our ‘father/daughter dance’. My dad is deaf and while he can bust a move with the best of them, one of the things we spent a lot of time together doing when I was younger was shooting. It only seemed fitting that we have a different kind of ‘dance’ -a nerf gun shootout at our wedding. Complete with ‘the good the bad and the ugly’ old western music. Dad still claims I gave him a broken gun, but it’s not true. I’m just a really great shot ;).